Today I am sharing a post that I originally wrote up here. This was a project that my girls did with Zoey last summer and it was a fun and easy one and would go perfect with Jen's summer lounge chairs as well as the lemonade stand! Items Needed: a bamboo placemat, a roll of ribbon (both from the dollar depot), key rings, hot glue, a tongue depressor and assorted foam stickers. The first thing we did was to cut 4 lengths of ribbon about 10" longer then your placemat. Hot glue the ribbon to the placemat (see pictures below)...I purposely glued the top ribbons closer to the center, and the bottom ribbons further out, so that when they came together at the ring it was more interesting, and I felt that this would provide better stability for the dolls. Then while I looped the ends through the key ring and hot glued the ends together, the girls decorated the tongue depressors. We added this step mostly to be able to know whose was whose, and to give the girls a little more to do. These were painted with watercolors, then decorated with foam craft stickers. Finally we tied the hammock between two child-size chairs, and the dolls enjoyed a new place to relax! 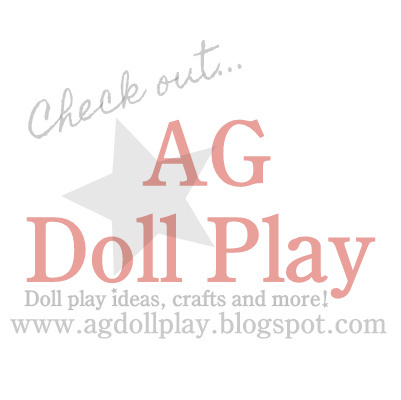 As always, please share photos of any projects that you create based on our posts here on the AG Doll Play blog. We would love to see them! You can share them on our Facebook page or send them to us via email. this is sooo cool! I must have one for camping! This would be an awesome project for camping! This is so cute! I will have to make one! Thank you for all your creative ideas!